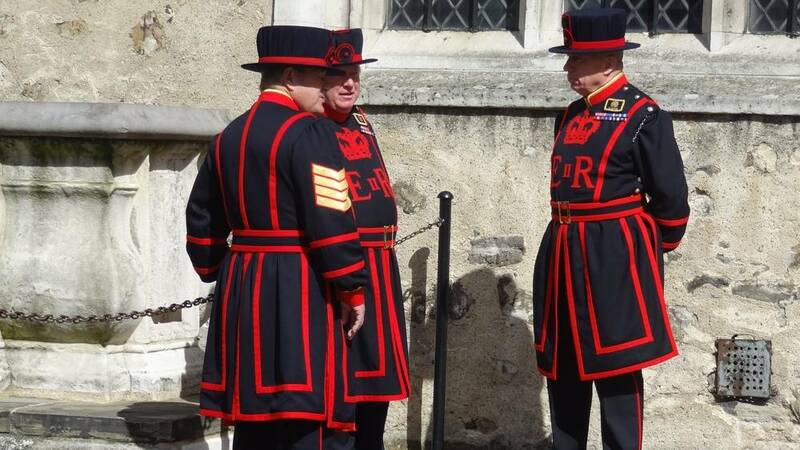 The guardians of the Tower of London are very specific, they are called the Yeoman warders. They were initially a guardhouse for watching the jewels of the crown. They are the history of the Tower of London, they know it by heart and its apt to give you any indication about it. Sometimes they are confused with the "Yeoman of the guard", a body of the British Royal Army that has nothing to do with them. The Yeoman Warders were created in 1485 by King Henry VII. A little later in 1509 his son Henry VIII moved the royal residence out of the Tower of London, so the body was split into two separate groups. The majority of the Yeoman Warders followed the king, but a small group of 12 guards remained in the tower to maintain the former royal residence, probably in order to keep it in good condition for the possible return of the king. Their main duties became prison guards, and it was on this occasion that they changed their name to Yeoman Warders to reflect their true work. (In English, the word "warder" refers to a prison guard. Nowadays there are 27 Yeoman Warders and a Warders chief at the Tower of London. The qualifications for this post are to be retired from the armed forces of England or the Commonwealth, a former senior non-commissioned officer or a naval sergeant with at least 22 years of active service. They must also hold the Long Service and Good Conduct medal. In 2007 this body of only masculine weapon was fiminized with the arrival of a first woman Yeoman Warders, Moira Cameron. There have been new changes recently with permission to join the function as a non-commissioned officer in the Army, Navy or Royal Air Force. Members of the Royal Navy are not eligible for the function because they pledge allegiance to the Admiralty and not to the Queen. In 2011 this allegiance was converted towards the Queen and suddenly the "First Naval Yeoman Warder" asked to be able to integrate the Yeoman Warders of the Tower of London. It was accepted. The institutions ask the families of the Yeoman Warders to live in the Tower of London, some of these houses were built as early as the thirteenth century. The Tower of London has its own organization which is composed of a governor who resides in the tower, a chaplain, a doctor and even a pub. The only problem for them, or at least one of the main problems the guards encounter is that once the tower has closed its doors it is impossible for them to get out. The uniform of the Yeoman Warders is normally dark blue with red stripes. For official occasions such as the Queen's visit, they wear a red and gold uniform very similar to that of the "Yeoman of the Guard". These uniforms refer to the traditional Tudor outfits that were slightly modified in the 15th century because of their discomforts, they had a collar too wide. 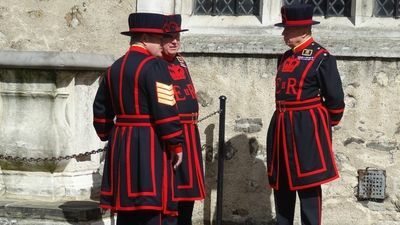 The Yeoman Warders are nicknamed "Beefeaters". (Meat Eaters) The reason for this nickname is unknown, but it is most likely one of the following two reasons: Either it was because they were the guardians of the tower, they had to be well fed and therefore had of a portion of food superior to the other soldiers. But maybe the reason is more pragmatic: The "Beefeaters" might very well have been the crows that need their daily doses of meat. The nickname would come from the fact that they were the guardians of the meat eaters. Nowadays there are about 150 people living in the tower of London: the Yeoman Warders of course, but also their families. The key ceremony is a long-standing tradition that takes place every night at the Tower of London. It dates from the fourteenth century. The keys of Queen Elizabeth! At this moment the group moved and returned to the tower, definitely. The ceremony is concluded by taking the keys to the Queen's house and storing them in a safe place. This ceremony, very touristy today, is obviously visible by the many visitors who agree to stay so late in the tower, and especially who have organized themselves to be able to participate. The Yeoman Warders kiosk should be checked during the day to find out the conditions for participation in the evening ceremony.